10V4160 In Stock! Reliance Electric GV3000 Drives | Reliance Electric 10V4160 10HP NEMA 1 460V GV3000 GV3000/SE Sensorless Enhanced AC Drive. 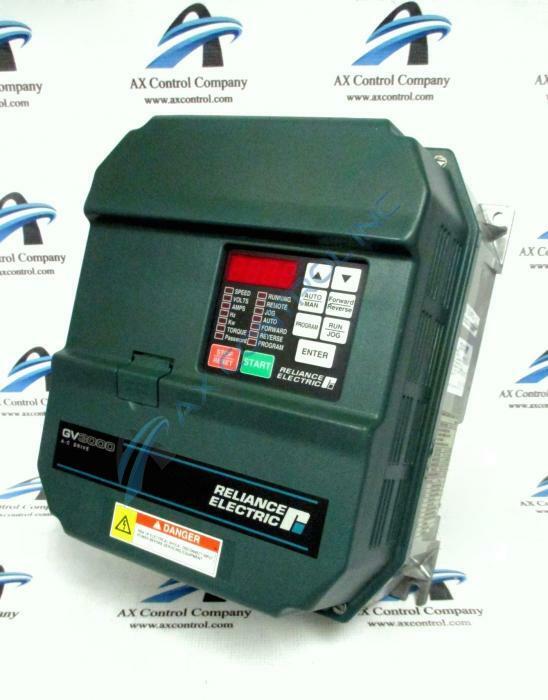 Reliance Electric 10V4160 10HP NEMA 1 460V GV3000 GV3000/SE Sensorless Enhanced AC Drive. Where are the encoder connections on 10V4160? The encoder connections for 10V4160 are terminals 4-9 on 10V4160's terminal strip. Which parameter on 10V4160 determines the performance of the torque regulator? Parameter U.015, the torque regulator integral gain parameter, is the parameter on 10V4160 that determines the performance of the torque regulator. This parameter on 10V4160 has a range of 10.0 to 628.0 radians/seconds, but it is recommended that this parameter is not changed on 10V4160. What does the "HId" fault code error mean on 10V4160? When fault code "HId" appears on 10V4160, it indicates a function loss fault on 10V4160. This fault is caused by the function loss input on 10V4160's control terminal being opened. To correct this fault, check external interlocks at 10V4160 terminals 16 and 20. How do I get the manuals for 10V4160? You can get the manuals for 10V4160 through us. We can send you links to the manuals or physical copies of the manuals with your 10V4160. The manuals for 10V4160 are Reliance GV3000 software and hardware manuals, Manuals D2-3359 and D2-3360. The 10V4160 installation process can be completed quite easily using the software and hardware manuals. These manuals may be different for the 10V4160 by version or firmware. The 10V4160 drive takes 460VAC power and does not use a battery of any sort. Is AX Control a Reliance Electric Authorized Distributor? While we are not, because these drives are no longer supplied by the manufacturer, many customers have turned to us as a source for new surplus and reconditioned 10V4160 GV3000 drives. The 10V4160 GV3000 or VTAC7 drive is one of the most common and widely installed drive models under the Reliance Electric product line. Since Reliance Electric was purchased, which manufacturer carries the product migration?